Women's History Month: Women, Veterans, Seniors In The News! Women’s History Month: Women, Veterans, Seniors In The News! March is Women’s History Month, when we celebrate the women who quietly made history both in and out of the history books. This month, we bring you three American women who served in the military, blazing a trail and inspiring the women and soldiers of today. Caregivers and loved ones may, or may not, know their names, but you certainly know their work! Like many women when the U.S. entered World War II, Grace Murray Hopper joined the United States Naval Reserves. Unlike many of her fellow Rosie the Riveters, ‘Amazing’ Grace had a PhD in physics from Yale, so the Navy assigned her to the Bureau of Ordinance Computation Project. In 1943, computers were anything but personal, especially the Navy’s Mark I which measured 51 feet long and eight feet high! Try bringing that to the coffee shop! Grace became the Mark I’s third programmer, mastering its language, and that of its two successors. She wrote the first compiler for a programming language – very simply, a program within a program that allows machines to talk to one another. After the war, she was on the team that built the UNIVAC I, which went to customers like the U.S. Census Bureau, the U.S. Air Force, and Atomic Energy Commission. Then, she developed the first independent programming code – one that was not invented for a specific machine, but rather could be used on any machine – which eventually became COBOL. COBOL is the great-great-great-granddaddy of the code that developers use today, but Grace Hopper started the language evolution that lets you program your DVR from your smartphone. After retiring, and getting reactivated by special Presidential order, several times, she finally retired in 1986 at as a Rear Admiral, with great reluctance, despite the award of the Defense Distinguished Service Medal. She is a hero to women in technology and the military alike: she is survived and honored by the Navy destroyer USS Hopper and the Cray XE6 ‘Hopper’ supercomputer. 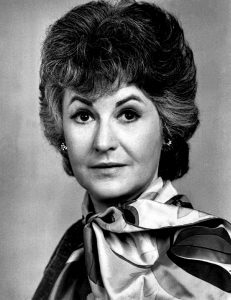 And the most famous face of all, Bea Arthur, began her working life in 1943 as one of the first members of the Women’s Reserve of the Marine Corps. She was a typist, but also drove trucks, earning a promotion up the ranks to staff sergeant. Despite this, and to no one’s surprise, her enlistment interviews mention that she was argumentative, over-aggressive, and officious! After her honorable discharge in 1945, she married, and moved to New York with her new husband in 1947 to study acting. She had a successful career on Broadway under her caftan before she took the iconic role of Maude, and maybe her military skills came in handy as she led the wacky band of misfits that were the Golden Girls.